Given the way the day is going and how many of you are tied to your chairs, it’s probably not exactly a good idea to talk about weight scales. But in this second twofer of the day you’ll get exactly that: A new GPS watch to remind you that you haven’t walked enough yet today, and a WiFi connected Fitbit scale to remind you that you ate too many of those M&M’s from that four-pound bag I linked to earlier in the day. Oh, as for the watch – the Ionic has music on it and can stream from various services – including ones that offer Coldplay and Weird Al. Also, you can use that contactless payments to purchase even more M&M’s, though, you’ll have to do it in person somewhere and not just online. Still, I suspect you can get your fill of candy somewhere locally. And of course, in the unlikely event you were to depart your DCR Giveaway Extravaganza control room – it has GPS built-in for tracking all your outdoor worldly activities. 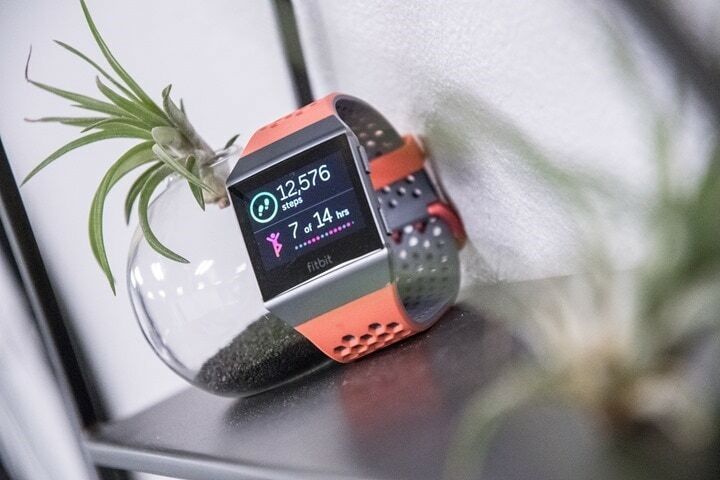 Fine Print: Fitbit Ionic in the color of your choice, plus the Fitbit WiFI scale. Even if you don’t win, you can still support the site by using either Clever Training or Amazon, both of which are listed at the left. If you purchase through Clever Training or Clever Training Europe, DCR readers can use coupon code DCR10BTF to save 10% off most orders (or get 10% back in points on almost anything else), plus most devices get free shipping too! Support via Clever Training makes giveaways like this possible! Or, you can simply buy anything on Amazon using the links here – like this completely practical yet bizarre attachment for your cell phone that keeps your dog focused on taking the perfect selfie. It’s kinda hard to explain. To enter, simply leave a comment below within the 2-hour timespan specified above. All entries must be posted below in the comments section by the time the giveaway officially closes per the posted times above. Winners will be chosen randomly. Products will be shipped to winners within a few days by Clever Training. Everyone worldwide is, of course, eligible as always. Comments may take a short while to show-up, simply due to the various spam-filters catching them. I’m going through manually and approving any caught comments. So refrain from re-trying 17 times, fear not, it’ll show up. Note, only one entry per person per giveaway item. If you have questions on giveaways, see my FAQ here! Click here to see all Giveaway Extravaganza Posts from today! Or, you can follow on Facebook or Twitter to get updates just as the contests start! Nice! A watch and a scale! This giveaway is fantastic! Going in for the watch. Scales are just an extra. No Whammy, No Whammy, Big Bucks! Thanks for the giveaways! Almost mBiissed entering this one! Thanks for all the info and content! Fitness with the power of ions! It would be great to own a smart watch! I would love to have one of those! First one I’ve been able to enter since I’ve been out in the middle of no where! Fitbit would be a prefect gift. Ahhh another awesome giveaway! Thanks DCR! Just laid off so could use a new toy to occupy my time.